The weather faked me out with a record high of only 66° yesterday. I pulled out my soup pot and fuzzy socks for full fall mode. 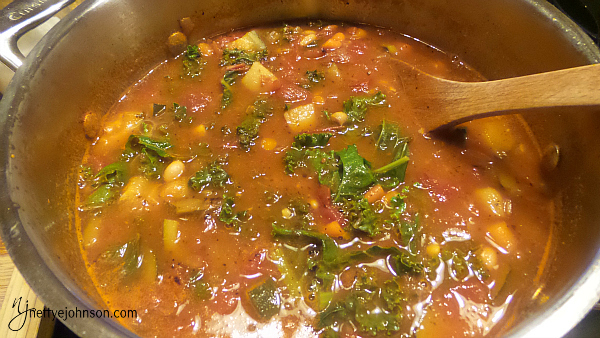 Today it is 84°, but the soup is going on – Hearty Fire Roasted Tomato, Kale and White Bean Soup. The broth bases make it light, and the potatoes and carrots give it stick-to-your-ribs substance. The sweet and smokiness of the fire roasted tomatoes beautifully balances the creamy buttery white beans. Six vegetables. Sixty minutes. You’ve got to give this a try. Prep the first four ingredients. Cut the onion and carrots into a medium dice. 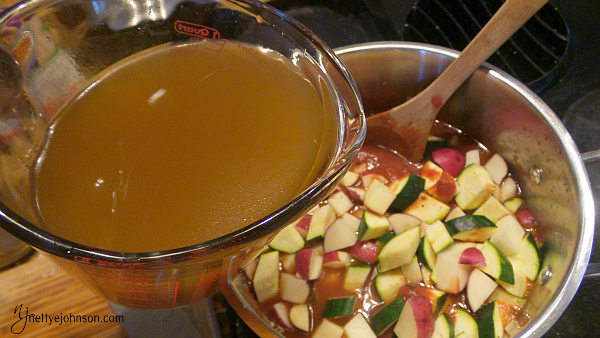 Scrub potatoes and wash zucchini. Cut into 1/2-inch rounds and quarter the rounds. Heat olive oil in soup pot over medium heat. 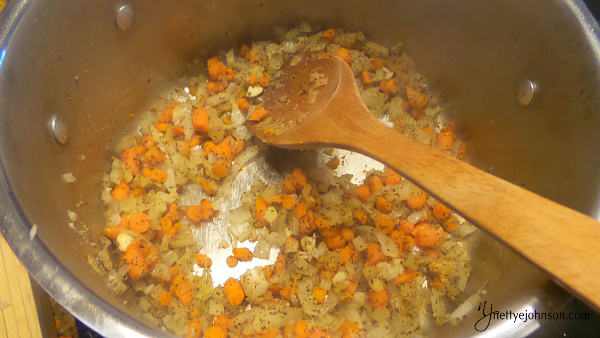 When it glistens, add onion and carrot. Saute till onion is translucent. Stir in salt, garlic powder, basil and oregano. Cook about 1 min stirring to prevent sticking. 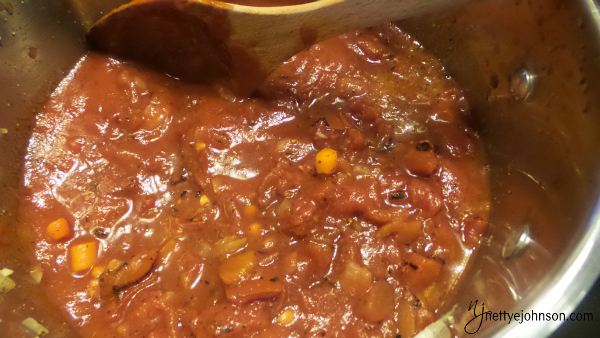 Stir in minced garlic,fire roasted tomatoes and tomato sauce. 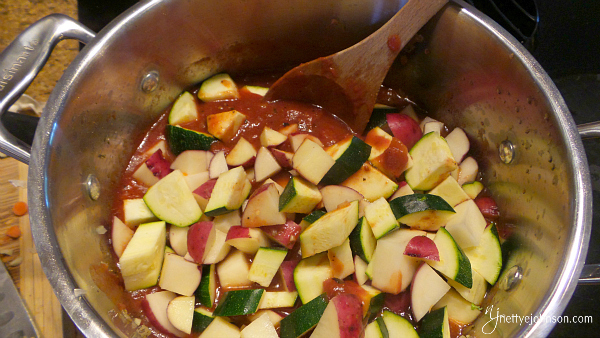 Add the potatoes and zucchini. Heat until the soup comes to a boil. Reduce heat to low, cover the pot and simmer for 20 minutes. Drain and rinse the white beans. Add to the pot, cover and simmer for another 10 minutes. Taste and adjust the salt. Wash and dry kale. Remove the stems and roughly chop the leaves. 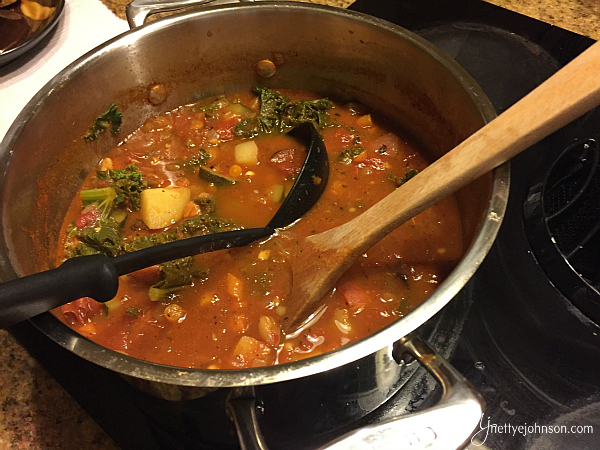 Stir kale into the pot. 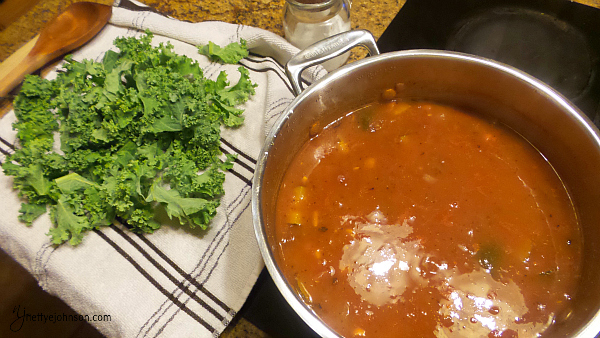 Cover and simmer until kale wilts, ~5-10 minutes. This is a hearty vegan soup. 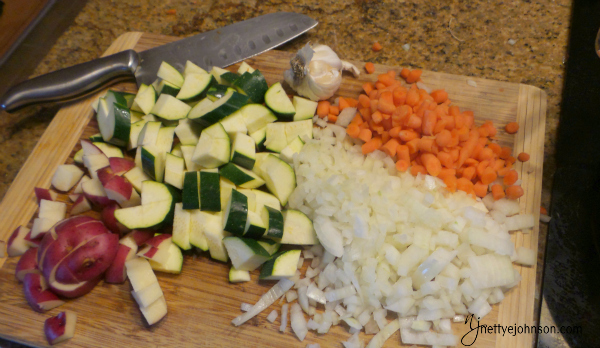 Meat lovers might consider chicken stock instead of vegetable stock and/or adding Italian sausage to the soup. Before you do, please try this vegan version. My meat loving husband came into the kitchen for a ‘quick taste’ of the soup. He sat down and ate two full bowls. Said it was delicious. Our ten-year-old, sometimes picky son also gave it the thumbs up. Like all my food sharing, this more or a method than a recipe. Change/adjust vegetables and spices to your liking. An exception to the last point, please, please, pleaaase don’t use regular diced tomatoes in place of the fire roasted tomatoes. The soup will not be the same. 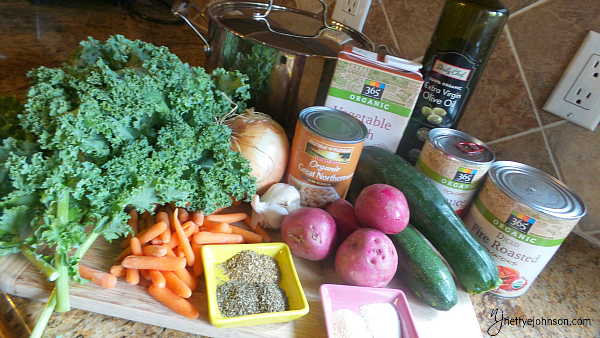 The soup gets better with time so it is wonderful for Souper Saturday. Make a pot on the weekend and enjoy it for lunch or supper a few days the following week. It also freezes well. My soup is a lightly adapted version of a recipe from Minimalist Baker. The recipes on her blog are AMAZING! 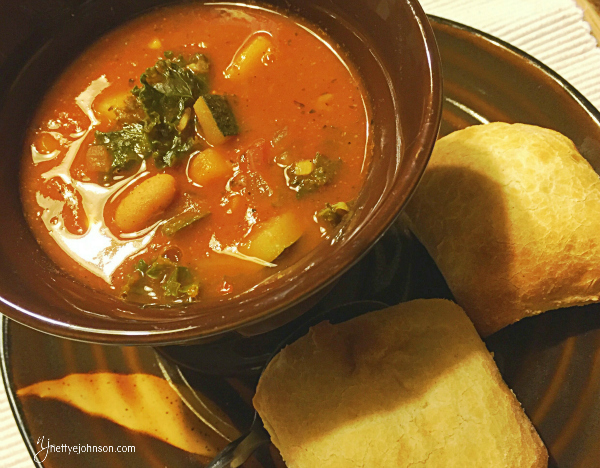 Give this soup and try and let me know your thoughts. What is one of your go to fall soups? I hope you found the tips above helpful. If so, be sure to share with a friend! If on a desktop or laptop, simply use the sharing buttons below.